By definition, bacterial growth is cell replication – i.e., growth of the culture. Most species of bacteria replicate by binary fission, where one cell divides into 2 cells, the 2 cells into 4, the 4 into 8, etc. 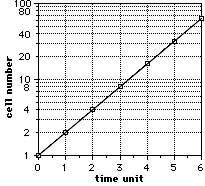 If this cell division occurs at a steady rate – such as when the cells have adequate nutrients and compatible growing conditions – we can plot numbers of cells vs. time such as on the graph at right. Before too long, we will need to extend the paper vertically as the population continues to double. For a culture where cells divide every 20 minutes, one cell can result in 16,777,216 (i.e., 224) cells after just 8 hours – barring nutrient depletion or other growth-altering conditions. If we were to convert our vertical axis to a logarithmic scale – as on the graph at right – we will not need as many sheets of graph paper, and we will find that a steady rate of growth is reflected as a straight line. (On the vertical axis, the same distance on the paper is covered with each doubling.) This type of graph paper is called semilogarithmic graph paper on which we will be plotting our class results. The numbers we plot will fall on the graph at the same place the logarithms of these numbers would fall when plotted on conventional graph paper. 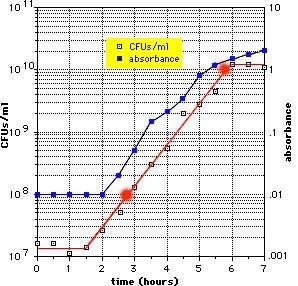 When we graph the CFUs/ml and absorbance on the same graph, we would hope to see an upward trend for both. Sometimes the absorbance continues to rise after the CFUs/ml level off into the maximum stationary phase. What would be the cause of that? 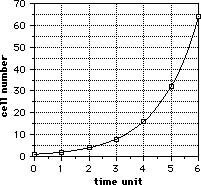 With a clear graph, one should be able to determine the generation time without the use of formulas. Just look for a doubling of the population and the time it takes for that to happen. For example – in the above graph – the time it takes to go from 3 X 109 to 6 X 109 appears to be approximately 30 minutes, which is close to the generation time determined above. The laboratory manual referred to herein is referenced here. Check out the growth curve questions on pages 157-158.
including a necessary clarification (in red).